Deli the New Way: What started out as a gourmet deli has expanded into a gourmet deli-slash-restaurant concept. Feather & Bone now has five locations across Hong Kong, its latest being in the heart of Central. Look & Feel: Conveniently located along the Central—Mid-levels Escalator, Feather & Bone’s Mid-levels location is as spacious as it gets, featuring two floors and a lush rooftop terrace with patio seating bedecked in fairy lights — perfect for casual alfresco dining. Of course, as with all Feather & Bone branches, there’s a generous retail section, too. On the Menu: With a new location comes a new menu. New offerings follow the restaurant’s tried-and-true formula of sharing plates supported by cuts of meat from the butcher’s counter, as well as sandwiches. 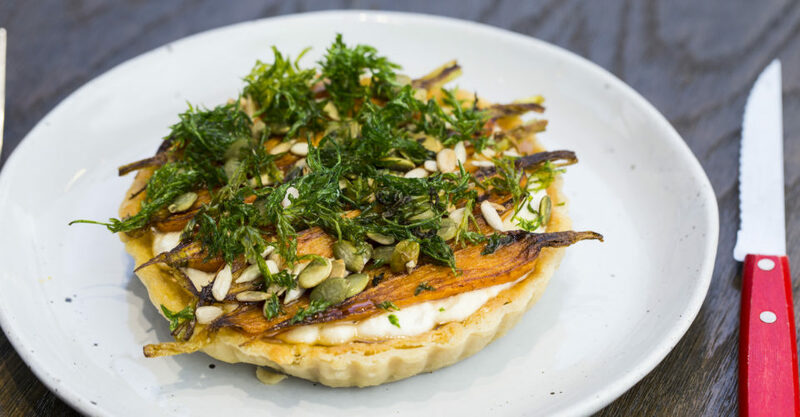 Expect raw dishes such as the burrata di buffala ($148) served with fresh figs, balsamic and basil, and small and large plates such as the Not-Your-Momma’s Meatballs ($138) and the Carrot Tart ($168, pictured). Great For: Diners who enjoy meat dishes created exactly to their specifications. FYI: Never eaten at Feather & Bone before? When you’re ordering a meat dish, go right up to the butcher’s counter and pick your cut and how you want it cooked, as well as your accompanying sauces and garnishes.